Contrast that to the omnidirectional mush we get, both in policy and guidance, from Fed Chief Janet Yellen and the FOMC. Interesting to observe that the Nikkei 225 and Dow Jones Industrial Average are in similar trading ranges, north of the 18,000 mark. However, the Nikkei 225 is up about 25% in last year, has passed the DJIA, and now is moving away. My only complaint: Governor Harada should dump his inflation target (IT) for an aggressive NGDP target, or failing that, say that BoJ has an IT of “around 3%–the precise amount is not that important.” A hard 2% IT target could become a noose—and a monetary noose is not what Japan ever needs again. Do we really need MatLab to perceive reality? I thought: surely, MaMos would accept that monetary policy works with long and variable lags, the phenomenon, emphasised by Milton Friedman, that this blog is named after? And that therefore we’d get macroeconomic volatility from imperfect control? However, Noah Smith pointed me to this post by Scott Sumner, the leading MaMoist, which contains the phrase ‘long and variable lags is a myth’. The argument in this post seems to me to be full of holes. So, while I wait for an anti-MaMo Matlab program to finish, I will explain why. 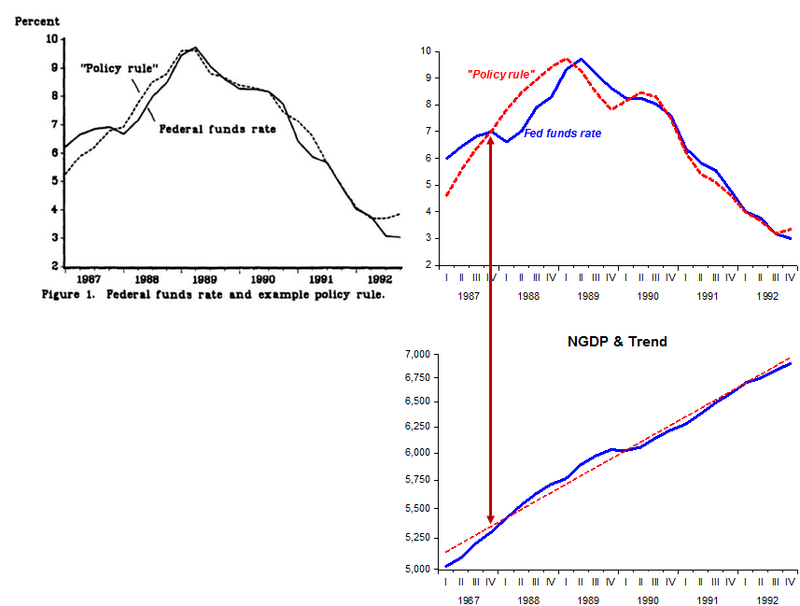 VIRTUALLY all modern discussion postu-lates that the lag in effect of government fiscal, monetary, and debt-management policies is short enough that they can be used in some active manner to dampen economic fluctuations or to offset factors tending to cause them. Milton Friedman challenges this view, arguing that monetary policy acts with so long and variable a lag that an attempt to use it actively may aggravate, rather than ameliorate, economic fluctuations. Friedman uses this allegation to support his prescription for a constant growth in the money supply in preference to any actively anticyclical monetary policy. This note points out some troublesome implications of the long-lag hypothesis and examines the evidence that Friedman offers in support of it. 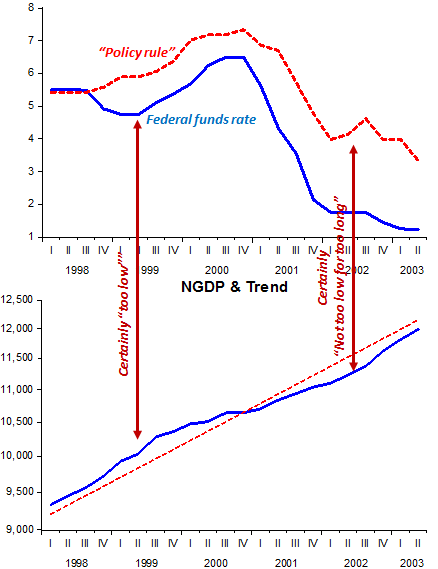 The evidence that Friedman offered in support of his testimony on this subject is that described above-the fact that there is a long and variable lag between the peak rate of increase (decrease) in the money supply and the downturn (upturn) in business. This seems so unconvincing that I wonder whether Friedman does not have something else up his sleeve. However, if he does, we should have it, so let me point out some flaws in his case as it stands. The most promising approach to estimating the lag in effect of government stabilization policies seems to be an analysis of the channels through which they affect the economy and an appraisal on the basis of experience of the time that it takes for effects to pass through each channel. The broad record of experience seems to me to support the view that anticylical monetary, debt-management, and fiscal adjustments can be counted on to have their predominant direct effects within three to six months, soon enough that if they are undertaken moderately early in a cyclical phase they will not be destabilizing. This is only a permissive conclusion-it does not indicate what stabilization policy should be. But it is a permissive conclusion upon which all building must depend. The lag doctrine would destroy any foundation for an active stabilization policy and would seem to raise serious questions as to the viability of a market economy. Maybe what Friedman “had up his sleeve” was the desire to discourage government/central bank from trying to fine-tune the economy! More than 50 years have passed since Culbertson wrote his article. During this time there´s a “lot of experience to be appraised”. Almost 30 years before Culbertson´s article, in March 1933, when FDR changed the monetary policy regime, he automatically changed expectations of future monetary policy. In the next 4 months, industrial production went up by more than 50% and there´s an immediate reversal of nominal spending and real GDP! With also immediate effect, in July 1933 there was N.I.R.A., which ground the recovery process to a halt! How long did it take Paul Volcker to break the back of inflation once he clearly put his mind to it and convincingly signaled his intentions? You can see it was “pretty quickly”, with scarcely a “lag in effect”. 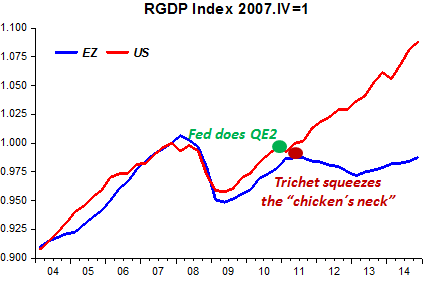 Or, quite recently, how long did it take QE (both 1 & 2) to “take hold”? 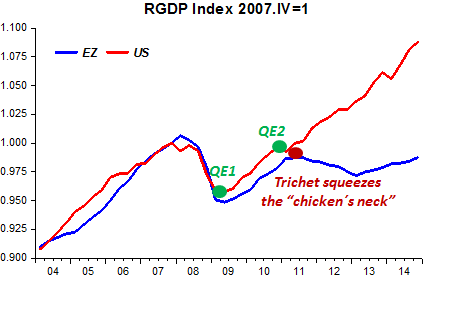 In the opposite direction, how long did it take Trichet (ECB) to “squeeze the chicken’s neck”? By all means, keep on working on your MatLab “MaMo take down model”! Sad to say, a defeatism or resignation has set in among economists, to the effect that the current economy is okay, the best we can do. Some rhapsodize for minor deflation as an economic cure-all. Even some of my Market Monetarist brethren have sunk into lethargy. “The way I measure it, it’s probably tantamount to what we saw in the later stages of the Great Depression,” Greenspan told anybody watching CNBC’s Closing Bell. No coincidence that the Greenspan Years are also largely the “Great Moderation” years, in which the US economy grew about a little more than 3% real annually, and inflation was just under 3%. Yes, Greenspan did not turn ninny at 3% inflation. The old Fed chief also told CNBC that Q4 real GDP growth could peg in at under 2%. In short, we have in the U.S. feeble growth, and dead inflation—conditions absent in the Greenspan years. The fact that the bond market is anticipating that the Federal Reserve will raise interest rates, yet the yields on the 10- and 30-year U.S. Treasuries are falling is an indication of how weak the overall global economy is, Greenspan told CNBC viewers. Who remembers anymore that Milton Friedman blamed three recessions on tight money: the Great Depression, the 1957 U.S. recession, and the Japanese perma-gloom post 1992. 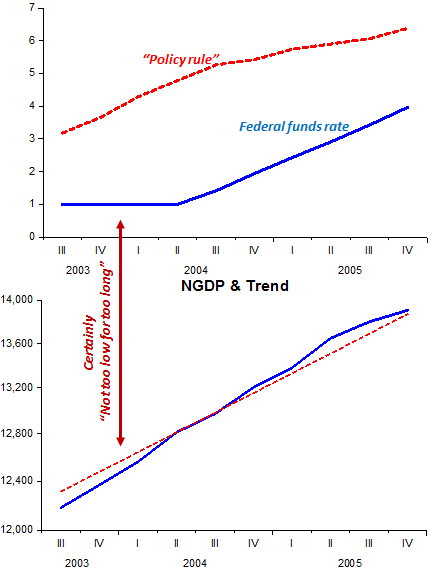 Name today a single right-winger who avers the Fed caused a recession and retarded growth post-2008 thanks to tight money. It is simply not done. And Greenspan, a President Ford White House economic official and then GOP-Reagan appointee to the Fed (reappointed by both GOP President Bushes), today would chart a more-expansionary course than “dovish” Fed Chief Janet Yellen and the FOMC. Alan Greenspan: Would you take the job again, for a just a few years? The COMMITTEE ON BANKING, HOUSING, AND URBAN AFFAIRS will meet in OPEN SESSION to conduct a hearing on the “Federal Reserve Accountability and Reform.” The witnesses will be: Dr. John B. Taylor, Mary and Robert Raymond Professor of Economics, Stanford University; Dr. Paul H. Kupiec, Resident Scholar, American Enterprise Institute; Dr. Allan H. Meltzer, The Allan H. Meltzer University Professor of Political Economy, Tepper School of Business, Carnegie Mellon University; and Mr. Peter Conti-Brown, Academic Fellow, Stanford Law School’s Rock Center for Corporate Governance. Additional witnesses may be announced at a later date. You can guess what the two highlighted names will say. Taylor will talk about the need for the Fed to follow Taylor-type rules. Meltzer will testify that “as I said 4,3,2 and again last year, the Fed is leading us down the hyperinflation road”. They should call nonpartisan Canadian economist Nick Rowe to testify! Expected inflation, as measured by financial markets, has fallen sharply since last summer in both the eurozone and the U.S. The response of their central banks couldn’t be more different. The European Central Bank reacted with alarm and soon decided to launch quantitative easing. By contrast, the Federal Reserve has shown a puzzling insouciance. Back in 2008, as attested by the Meetings Transcripts, quite the opposite was happening! NEW YORK–Federal Reserve Bank of San Francisco President John Williams said the door is open to central bank interest rate increases any time from mid-June onward. In an interview with The Wall Street Journal, Mr. Williams expressed a good deal of confidence in the U.S. outlook, especially on hiring. He said the jobless rate could fall to 5% by the end of the year, which means the central bank is getting closer to boosting its benchmark short-term interest rate from near zero, where it has been since the end of 2008. “We are coming at this from a position of strength,” Mr. Williams said. “As we collect more data through this spring, as we get to June or later, I think in my own view we’ll be coming closer to saying there are a constellation of factors in place” to make a call on rate increases, he said. An inflation target no more! 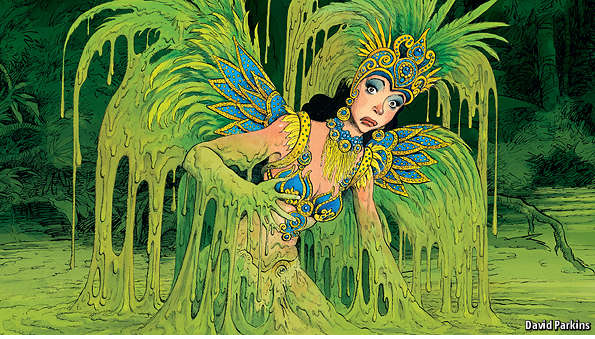 Brazil’s economy is in a mess, with far bigger problems than the government will admit or investors seem to register. The torpid stagnation into which it fell in 2013 is becoming a full-blown—and probably prolonged—recession, as high inflation squeezes wages and consumers’ debt payments rise (see page 71). Investment, already down by 8% from a year ago, could fall much further. A vast corruption scandal at Petrobras, the state-controlled oil giant, has ensnared several of the country’s biggest construction firms and paralysed capital spending in swathes of the economy, at least until the prosecutors and auditors have done their work. The real has fallen by 30% against the dollar since May 2013: a necessary shift, but one that adds to the burden of the $40 billion in foreign debt owed by Brazilian companies that falls due this year. During her first term, the damage done is well summarized by the chart below. And to reverse those trends will not be an easy matter. If he tries too hard, Mr. Levy risks becoming the “neoliberal scapegoat”! 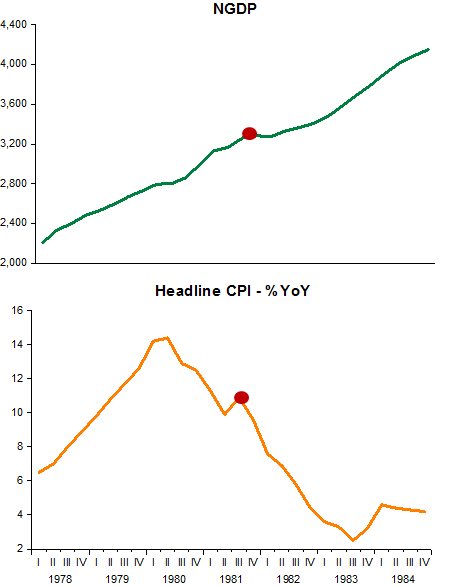 During the upward phase of the recovery, monetary policy just doesn’t matter that much. I can’t even imagine what a model would look like where that claim was true. 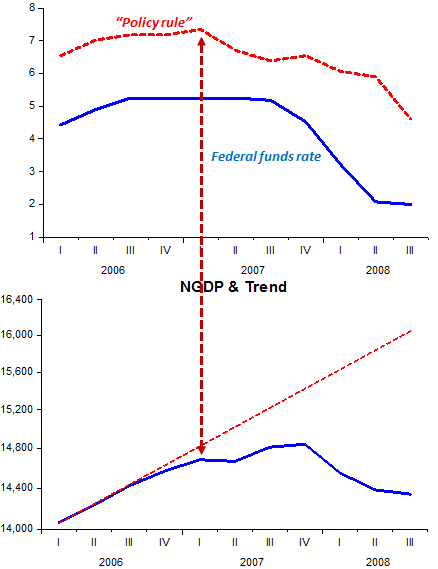 To see why it is not true, compare the post mid-2009 recoveries in the US and Europe. If monetary policy in the US and Europe did not matter very much during the recovery, then the tightening of monetary policy in mid-2011 in the eurozone ought to have had little effect. What does it look like to you? I was very interested by the new paper by Claeys and Walsh on “plucking” as an explanation of differential performance in Europe; basically, they’re saying that fast growth has come in countries that previously had deep slumps. But how does that result interact with the result many of us have found, which is that differences in austerity seem to explain a lot? What happens if you throw both variables in? With standard errors in parentheses, I get Growth in GDP 2009-14 = 7.91 – .26(.28)*Change in GDP 2007-9 – 1.41(.27)*Change in structural balance as % of potential GDP. Plucking might be important, but it’s hard to tell given the lack of data. Austerity, on the other hand, comes in very clear. Maybe the point is that there aren’t any deep mysteries that need explaining. You can point to individual countries and say that they did better than you might have expected, but any kind of non-cherry-picked analysis of the data really, really wants to tell you not just that austerity hurts growth but that it’s the major factor causing some European countries to do worse than others. That´s the correct conclusion when comparing countries that do not have an independent monetary policy. But what happens when you compare with countries that do have control of their monetary policy? Does austerity still stand out? 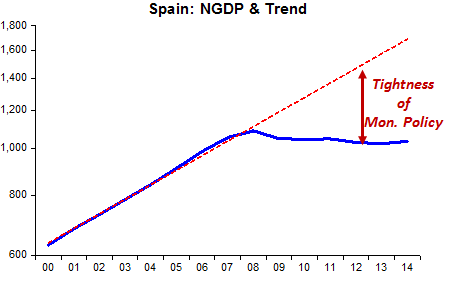 The charts compare Spain (no monetary policy) with Poland (own monetary policy). 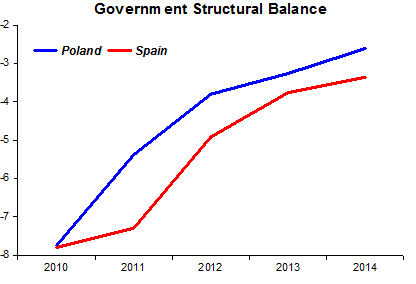 Curiously, austerity (measured by the reduction in the structural balance) was even stronger in Poland. Nevertheless, the Polish economy has done much better in terms of real output growth. The next charts show that monetary policy is much tighter in Spain, dependent on the ECB, than in Poland, with its own central bank! So once again, the evidence points to something unique to the Eurozone that affects both the economy and fiscal policy. The Eurozone’s tight monetary policy over this period fits the billing. It is reasonable to conclude, then, that had the ECB had not raised its interest rate target in 2008 and 2011, but lowered it and had it started its open-ended QE program back in 2009 there would now be a much brighter future for the Eurozone. Instead, we now face the prospect of a Grexit for which the ECB has only itself to blame. In his opening line of questions for Janet Yellen at the Senate Banking Committee today, Senator Richard Shelby asked about the use of monetary policy rules and the Taylor Rule, apparently referring to the recent policy rules bill (Section 2 of HR 5018) that would require the Fed to report its strategy or rule for policy. The headline-grabbing first sentence of Janet Yellen’s response was about not wanting to “chain” the FOMC to a rule, and it did get a lot of attention (including many real time tweets). But it was the rest of her response that really focused on the Senator’s question. Here is a transcript from C-Span (minute 28:39). 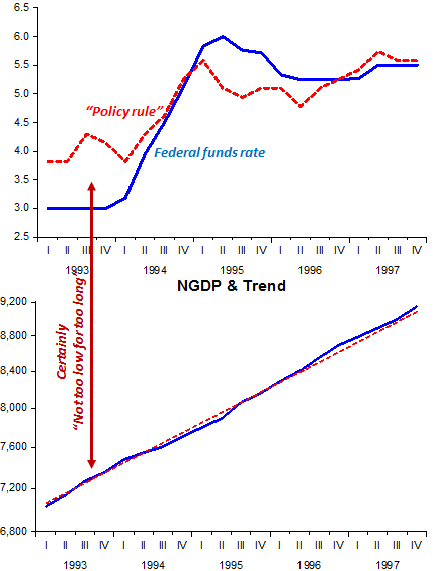 Notice how the funds rate was cut in 1987 while the policy rule setting kept rising. This is the deviation that Janet Yellen was referring to. It is actually quite small and temporary, but in any case the Fed could easily take such an action and stay within the terms of the policy rules bill. The Fed chair would simply explain the explicit reason for the deviation as required in the legislation. I can’t imagine the case would be difficult to make given the size of the shock unless for some reason the deviation continued long after the shock. This example illustrates a feature not a bug in the bill. The Record On U.S. Commercial Bank Deposits and QE Strongly Suggests Freshly Printed Cash Did Enter Economy, Was Stimulative and Worked As It Should. Okay, in my last post we saw that “QE only ends up as bank excess reserves, and is thus a largely inert Treasuries-for-bank-reserves asset-swap” narrative get crushed. We showed how the Fed printed (digitized) cash and bought $4 trillion in Treasuries and MBS bonds from the 22 authorized primary bond dealers (Cantor Fitzgerald, Nomura Securities et al), who in turn bought bonds on the open market. Primary dealers are mere intermediaries. During QE, the Fed credited the primary bond dealers with $4 trillion in reserves. So what? It is unimportant. The $64,000 Question: What did the actual bond sellers—those who sold their bonds to the primary dealers, who are mere intermediaries—do with their money? Some say the real bond sellers only put their $4 trillion in freshly printed cash into commercial bank deposits, where it is inert, as banks are not lending out enough. But the record suggests otherwise. See chart below. 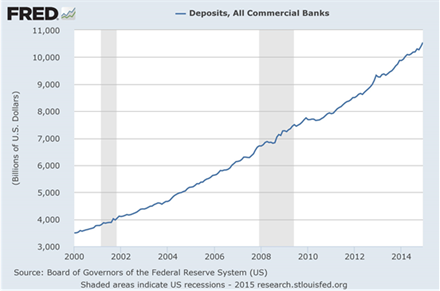 Obviously, commercial bank deposits stayed on their growth path, no $4 trillion bulge in the QE years. And just as obviously, anybody can make deposits in U.S. commercial banks, from cash-hoarding corporations, to households tightening belts, to foreign flight-capital refugees. So, not just bond sellers but others are making bank deposits through the QE years. It is worth nothing that since the Fed adopted QE in 2008 (running on and off through 2014), the Dow Jones Industrial Average has risen from about 8,800 to about 18,100, or more than doubled. Property values recovered as well. The economy has grown, if slowly. 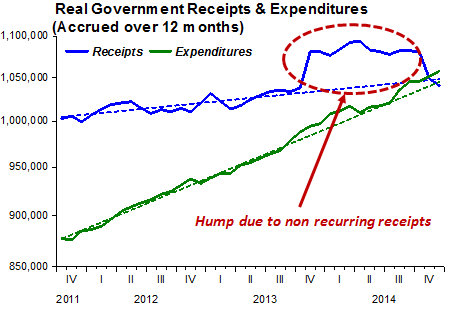 All that suggests QE freshly printed cash went…into other asset classes, or was spent. Which makes a lot of common sense. To be sure, much of the recent feeble recovery was normal economic forces at work. And the Krugmanites must be writhing at the fact the annual U.S. annual federal deficits shrank through the period, while the recovery gained speed. Equally baseless are the right-wing nostrums that QQ would cause hyperinflation, and if not that, it must be inert, locked up in bank reserves. It sure looks like QE worked, monetary expansionism worked, and just should have been bigger, harder and longer. Like the new Bank of Japan Governor Yutaka Harada says, “We have to print more money.” We can make the language fancy, cloth ourselves in sophisticated obscurantisms, but it comes down to the Fed printing money. Put the money-printing (digitizing) presses on “Red Hot High” and take a long, long vacation.